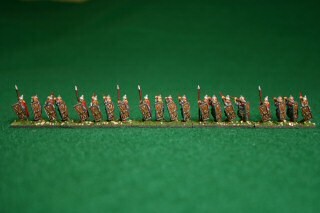 This article shows a miniature army in 15mm scale painted andbased for the miniatures game De Bellis Antiquitatis .Each army consists of 12 stands (known in the game as elements) of 2 to 4 figures per stand.The III/48 Rus Army represents eastern European peoples in the years 860-1122 A.D.The Rus were originally Scandinavian Vikings who sailed the Volga River and settled aroundthe area of modern day Moscow.The Rus are very Nordic in appearance.They are responsible for giving Russia its name. The Rus army has one variant. 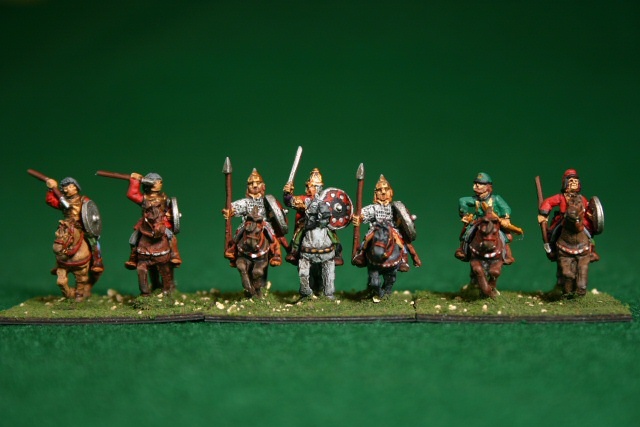 In the DBA game, the Rus have the following enemies:Early Slav, Early Bulgar, Thematic Byzantine, Magyars,Volga Bulgar, Pecheneg, Early Polish, Nikephorian Byzantine, Early Hungarian,Kanstantinian Byzantine, Early Russian.Their allies are Early Bulgars, Early Polish, Viking and Leidang, and Pechenegs. 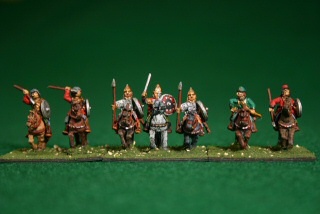 To the right we see the leaders: 1x3Cv and 2x2LH.The general rides the white horse in the center of the photo,with his trusty bodyguards (or sons) at his side.The figures are Essex figures and have very nice sculpting for the 15 mm size.The light horse on the right and left have some very cool features.The ones on the left have an almost oriental look with what appears to bea braided helmet or plaits.The ones on the right look somewhat like cossacks with soft hats and waistcoats.I painted these figures as richly as possible to make them looklike the aristocracy going off to war. 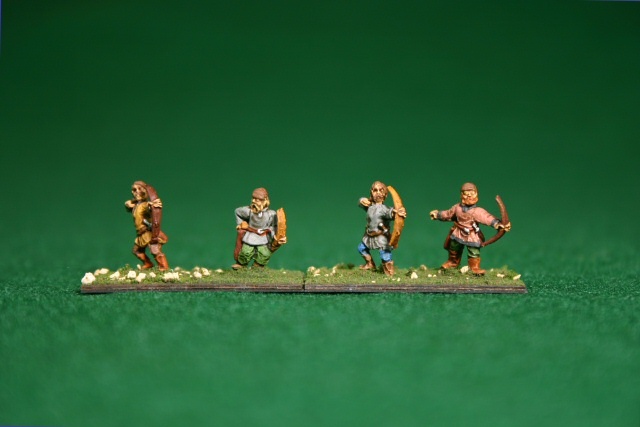 To the right is a photo of the 4x4Bd blades.To the left of center is a 4Bd stand that can be used as an alternate General.The rest are pointed helmed warriors with axes and broad swords.I like the big square shield with wood inset and metal decoration on the fronts. The figures are mostly Old Glory.I painted them with the "magic dip" method described at the Fanaticus site .Basically, paint them with acrylic paints with little or no highlighting or shading.Then dunk the completed figure an the ink-like productsuch as MinWax PolyShades Jacobean or Tudor shade.This product is a stain and polyurethane with a matte finish.Most of it runs off, but some shading is left in the crevices anddepressions giving the miniature a nice three dimensional look.Then I finish them with a matte clear coat to protect the figure.Especially with 15mm figures, this is a quick and easy method to paint an army. 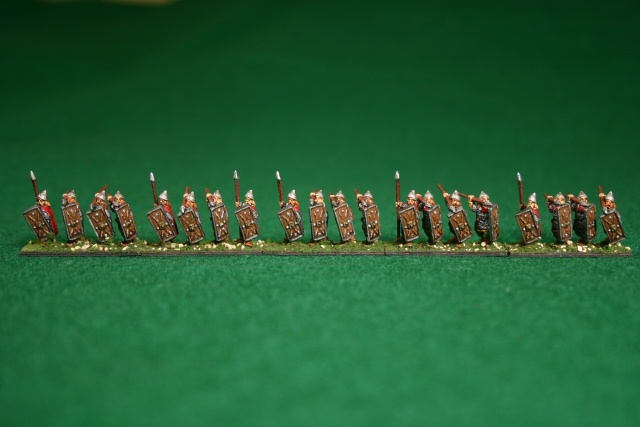 To the right is a photo of the 5x4Sp spear.These look like the rich spears, decked inchainmail shirts and red capes.I gave each of these figures some redbecause I read that Russians view the color redas beautiful. 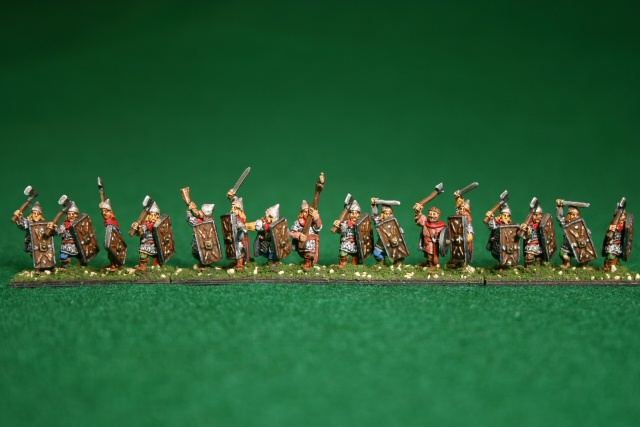 Two good reference works are the Osprey Publishing books Armies of Medieval Russia 750-1250 and Medieval Russian Armies 1250-1500 These contain many great Angus McBride paintingswhich are great for reproducing on your figures. 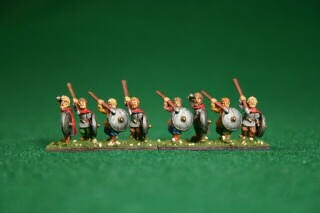 The metallics are Games Workshop.After trying different brands, the GW acrylicmetallics are nice and opaque and wash up in water.They have a very nice shiny look to them.The figures are mostly Old Glory. 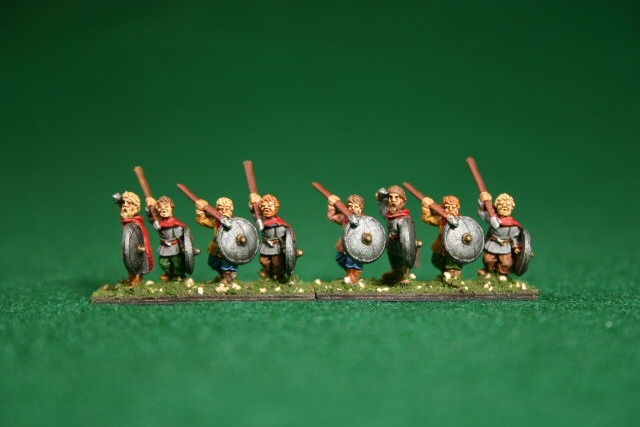 To the right is a photo of the 2x4Sp.These look more like militia than the previous set of spears.Of course, DBA makes no distinction.The more complex game DBM does have inferior and superiorclasses of spear.For DBA, these guys simply bring up the spear count to 7. The bases are from Litko Aerosystems.Glue the appropriate number of figures to the base,coat with white glue, and flock with static grass and peebles froma scenery company such as Woodland Scenics.I like thin bases that blend with the tabletop.These bases are laser cut plywood that barely warp, even when coatedwith dilute glue. 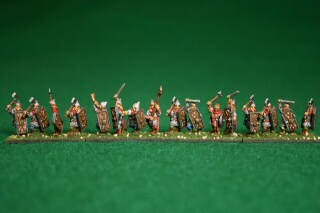 To the right is a photo of the 2x2Ps psiloi.These guys work well with spearmen, supporting them from behind witha +1 die modifier.Additionally, they can support 3 spear in front and add theirsupport to any of the 3 stands.Cool. 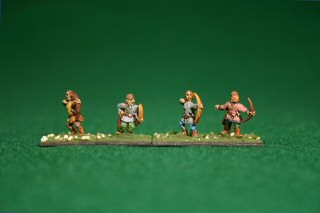 Nothing like stabbing with your spear whilethese guys lob arrows over your head into your enemy's line. Last modified: Thursday, 09-Jun-2011 12:42:01 MST.